We are moving back to the States soon, this time near Richmond, Virginia, and one of the many things I look forward to in our new city is eating Chesapeake Bay blue crabs. 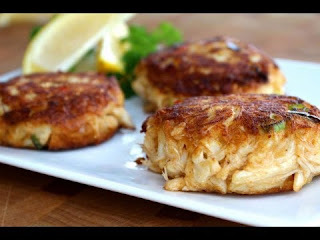 I love a good crab pickin' but a more efficient way to eat them is to buy lump crab meat and make it into crab cakes. I just got this recipe from a friend and couldn't find it online to pin, so I'm putting it here for future reference. Back in the 1970s, there was a restaurant in Baltimore called Thompson’s Sea Girt House. This recipe is reported to come directly from their kitchen, and since the Sea Girt House has been out of business for many years, I think I’m safe in sharing it. Enjoy! In a small bowl, combine egg, mayo, mustard, Worcestershire sauce, and pepper. Mix well. In a separate bowl, mix crab and crushed saltines, then add the egg mixture and turn gently, being careful not to break up the crab. Form into cakes or balls and refrigerate at least an hour. Fry or broil up to 5 minutes on each side until golden brown. If frying, drain on paper towels.